IL-23 promotes the development of an IL-17–producing CD4+ helper T cell subset. 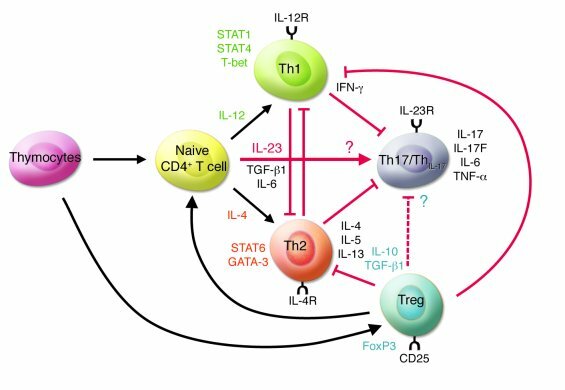 IL-23 induces the differentiation of naive CD4+ T cells into IL-17–producing helper T cells (Th17/ThIL-17) via mechanisms that are distinct from the Th1 and Th2 differentiation pathways. The transcriptional factors critical for the development of Th1 (STAT1, STAT4, and T-bet) and Th2 (STAT6) cells are not required for the induction of Th17/ThIL-17 cells. The transcriptional factor(s) essential for the development of Th17/ThIL-17 cells remain unknown. IFN-γ and IL-4 antagonize each other in the differentiation of Th1 and Th2 cells and the promotion of their function. IFN-γ also suppresses the differentiation of Th17/ThIL-17 cells by reducing IL-23R expression on CD4+ T cells. IL-4 also inhibits the development of Th17/ThIL-17 cells. It is not known, however, whether Th17/ThIL-17 cells inhibit the development of Th1 and Th2 cells. Tregs, an immune-modulating subset of CD4+ T cells, suppress the differentiation and effector function of Th1 and Th2 cells. Recent studies suggest that Treg-derived TGF-β induces the differentiation of Th17/ThIL-17 cells from naive CD4+ T cells in the presence of IL-6 in vitro (26). However, the precise effect(s) of Tregs on Th17/ThIL-17 cells are as yet unknown.